Blunders on the Danube: Spanish Napoleonic Army Review... and facing tables for Line Infantry, 1808. What an impressive and colorful army! Probably the loveliest uniformed army of the period - who cares of how history paints their war record. Thanks, Dean. Spoken like a true collector. It is arguably the most colorful army of the era! Certainly the reputation of the Spanish army has suffered from the British largely not giving them their due, and the French focusing on their victories over them, and blaming their defeats on the Guerillas and the British. The number of units raised buy the Spanish over the course of the Peninsular War is astounding, especially given the lack of an effective central government. I do not think it an exaggeration to to assert that without the "Spanish Ulcer", Napoleon might never have fallen from power. I love a parade, Peter, especially one with a Spanish flair! Fabulous looking Spanish army and a splendid accomplishment. Castanets and Flamenco dancers optional! Thanks Aaron; glad you liked them! Just played my Spanish army this afternoon (and won! )...We have to meet one day on the same table, yours is superb and colorful! Thanks for the kind words, Phil. The army would definitely not fly well in carry on baggage! :-) Congrats on winning with a Spanish (Napoleonic) army - a worthy accomplishment! Indeed, one of those "Wargaming Moments" that bears re-telling! A terrific display, and it has been great watching all this come together. The Spanish army really are a colourful lot, especially dressed in their pre British-supplied uniforms. Thanks, Lawrence, and a veritable rainbow they are indeed! Thanks, Mark. the army is a bit kaleidoscopic in color! Lovely colourful army,I misread "admire them as they run away," great diverse army and useful facing colour chart,an army Id really like to paint one day! Thanks Ian. Well, I had only been painting Napoleonics for nearly 40 years before doing any Spanish! Apparently the guns were more Blue Grey than Blue. Yes, this has been discussed in the relevant posts for the artillery bunits; a result of a lack of pictures/plates for the guns, and my taking the Cobalt Blue pigment used in the paint a bit too literally (the shade my carriages are painted in matches Cobalt Blue as a hue quite well). AmI going to repaint them? Heck, no! IIRC, the only Spanish who made it to Russia historically was the Regiment Joseph Napoleon, which is in the French OOB at Borodino. What a terrific accomplishment, great looking army. Congratulations. Thanks, Jon! I really enjoyed the variety of uniforms in this army! These look fantastic Peter. Gives me the urge to crack on painting my rather smaller versions. Thanks, Jon. Even in 6 mm, the Spanish Dragoons in particular will stand out in a crowd! They look superb arrayed for inspection Peter. A fine effort too. 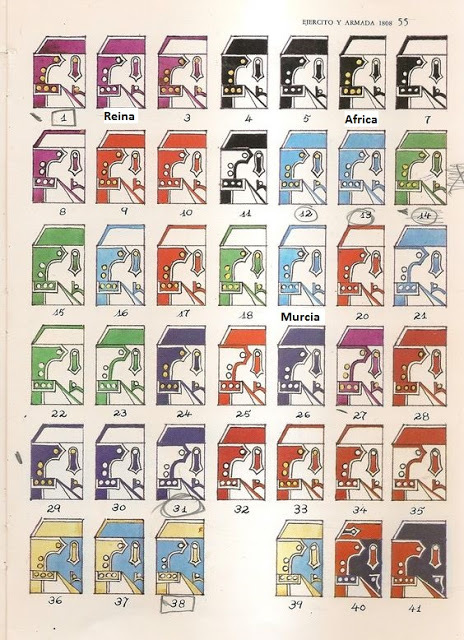 Those books by Jose Maria Bueno are invaluable aren’t they? Thanks, James. In my case, I had sufficient other sources to work with that I simply used the plate from the Bueno book, found on line, for illustrative purposes... although I would consider buying the book, having a basic command of Spanish!